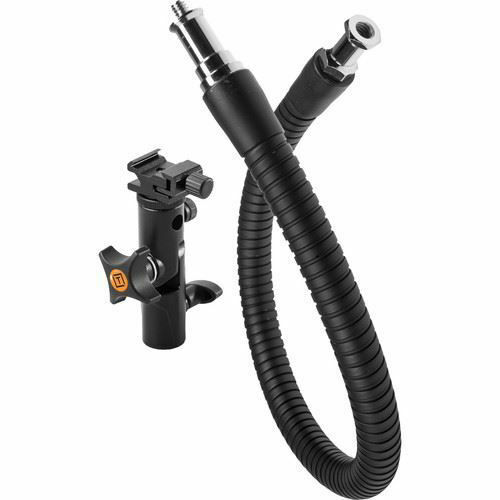 Rock Solid Heavy-Duty SuperFlex Arm | Flexible Gooseneck Design | 5/8" Stud with 1/4"-20 Male Thread | RapidMount Cold Shoe Elbow Mount | Mount Speedlight to a Stand or Arm | Locking 360° Swivel & 180° Tilt | Baby Stud Adapter for 1/4"-20 and 3/8"
Pairing two versatile and flexible mounting tools, the RapidMount SuperFlex Arm Kit from Tether Tools bundles the Rock Solid Heavy Duty SuperFlex Arm with the RapidMount Cold Shoe Elbow for an effective mounting solution for speedlights. The Cold Shoe Elbow is a two-part mount that permits 360° swivel and 180° tilt control over a shoe-mounted light, with the ability to securely lock-down each axis for fixing in place. An umbrella mount is incorporated into the design along with the ability to fit directly onto a baby stud or a 1/4"-20 or 3/8" threaded mount via the included adapter. Extending the versatility further, the included SuperFlex Arm can be paired with the elbow mount more control over positioning via its gooseneck design. This support measures 22"-long, can support items up to 1.3 lb, and also integrates a 3/8" female hex stud, 5/8" baby stud, and 1/4"-20 male thread into its design for a variety of mounting options. Support camera accessories weighing up to 1.3 lb with the flexible gooseneck Rock Solid Heavy Duty SuperFlex Arm from TetherTools. With versatility in mind you can twist the 22" arm into various positions, mounting one end into a super clamp to prevent unwanted movement while the other end supports a light, reflector, or related camera prop.